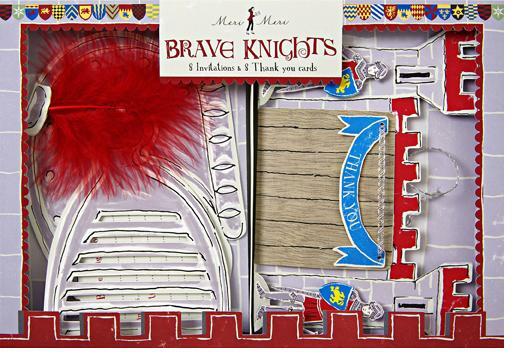 An Invitation and Thank You card set for a brave sir knight's party. The invite comes in the shape of a knight's helmet with visor and is embellished with a bright red feather. 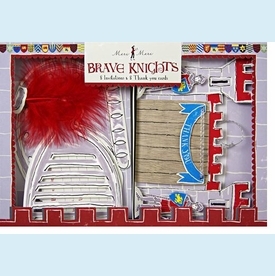 The thank you card is in the style of a castle with drawbridge and guard knights. The set includes 8 invites and 8 thank you cards. Both come with matching envelopes. NOTE: Last box! See matching plates, too! SIZE DIMENSIONS: 11 1/4" x 7 5/8" x 1 1/2"